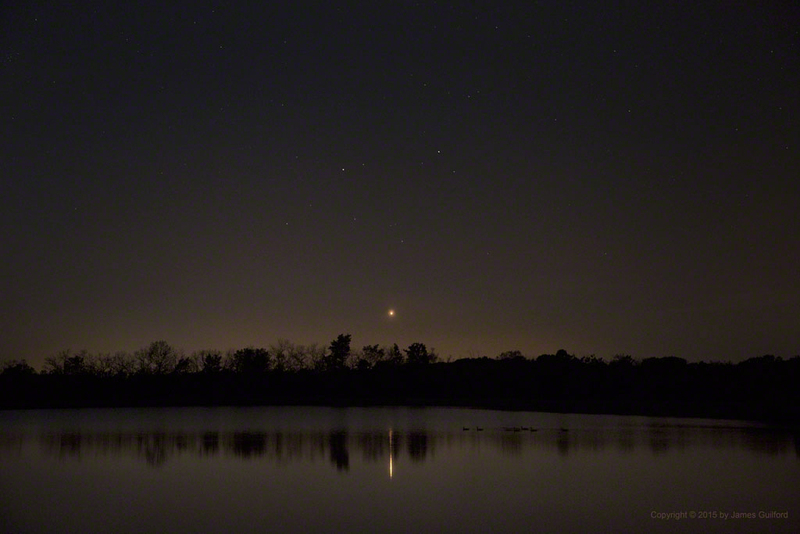 Venus and Gemini Setting over the lake in Letha House Park – Photo by James Guilford. Saturday night, May 23, the Cuyahoga Astronomical Association (CAA) held our first Public Star Party for 2015. The event took place at the club’s observatory situated on the grounds of the Medina County Park System’s Letha House Park in Spencer, Ohio. Members of the public were generally enthusiastic, excitedly moving between telescopes. The sky was beautifully clear and allowed excellent views of the Moon, Jupiter, Saturn, Venus, the Hercules Star Cluster (M13), M81 & M82, and other astronomical wonders. CAA President William Murmann wrote, “Thanks to everyone who attended and who brought scopes to help with the program! “The park staff said we had about 50 guests join us, including families with children. We had clear skies all day, but some high, thin wispy stuff moved in during the evening, although we had good observing. “It was nice to see to James Guilford, Steve Spears, Chris Christe, Chris Burke, Paul Leopold, Suzie Dills, Trevor Braun, Bob Wiersma, Jay Reynolds, Rich Rinehart, Bill & Carol Lee, Tim Campbell and Mary Ann, Steve & Gail Korylak, Rich & Nancy Whisler, Dave & Jan Heideloff, Carl Kudrna, Larry Smith — and new member Anita Kazarian, who joined us. Sorry if I missed anyone. “Noteworthy for the evening–Steve Korylak spotted Comet Lovejoy with his scope. Among the objects the public viewed in beautiful detail was Earth’s Moon. Early in the evening not only could observers see the brightly-lit portion of the Moon but also the Earth-lit shadowed portion of the disk. 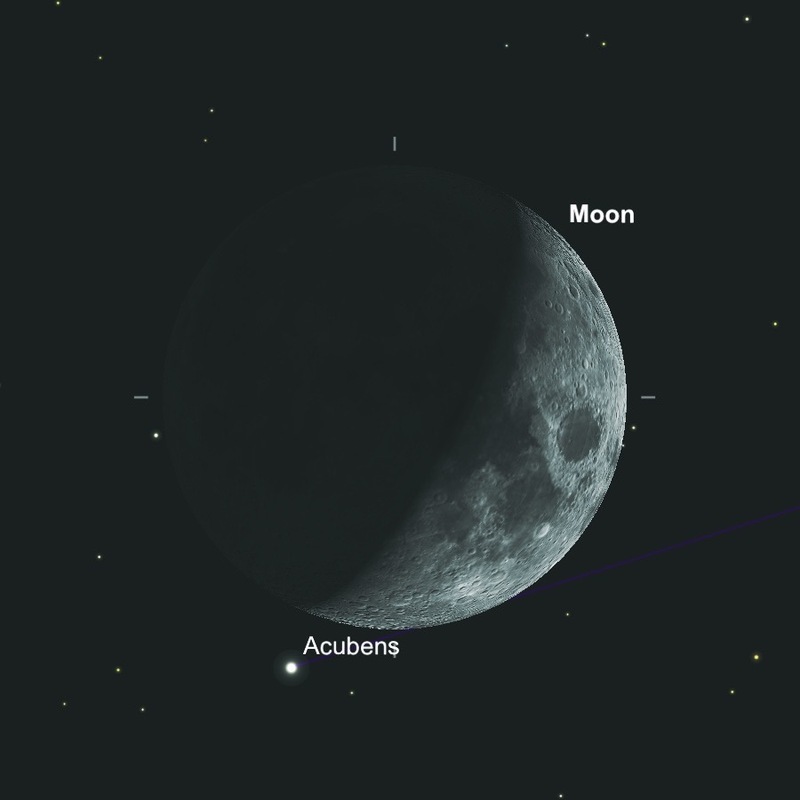 Adding to the scene was a beautiful speck of a star near the horn of the Moon: Acubens, a star in constellation Cancer. This entry was posted in Uncategorized and tagged astronomy, astrophoto, CAA, Jupiter, M13, M57, Moon, star party, Venus. Bookmark the permalink.